We ranked the posts by your clicks. On to the countdown! OSHA’s top 10 violations for 2017. 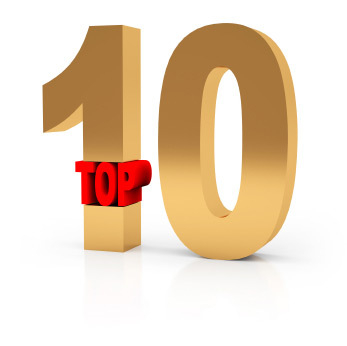 We start our top 10 list with … a top 10 list. This one is an annual favorite. There’s no better way to know what OSHA inspectors look for when they visit. Bad habits: Nun with chainsaw cleaning up after Irma (video). Sister Margaret Ann may have come in second, but her safety habits didn’t top our list. Husband sues 5 companies after factory robot kills his wife. The head injuries his wife received were so severe, a funeral director suggested a closed casket. Injured worker reportedly did ‘donuts’ with forklift: Will he get workers’ comp? Does “thrill seeking” on the job prohibit an injured employee from receiving comp? Worker falls 30 feet, dies; more than $1 million in total penalties. A judge issued the maximum criminal penalty to a Missouri company in connection with this worker’s death. Top 5 (and bottom 5) states for safety. The National Safety Council ranked the states. Is yours in the top or bottom 5? Was fatal car crash exception to workers’ comp coming-and-going rule? This case addresses the special assignment exception to the coming-and-going rule. Injury came from bending and twisting on the job: Why was he denied workers’ comp? A court found this employee’s injury didn’t arise from an actual risk of employment. Click to find out why. OSHA delays new recordkeeping rule. This was our story in May when the delay was announced. To find out about the current status of the rule, read this. Top 5 cities for rats. Orkin published its Top 50 Rattiest Cities List for 2017. We’ve also put together our annual Top 10 OSHA fines list for 2017. To read that, click here. Thank you for reading Safety News Alert in 2017. Best wishes for a safe 2018.